Review by AllTheBestFights.com: 2017-09-03, good second part of the fight between Shun Kubo and Daniel Roman: it gets three stars. The undefeated Shun Kubo entered this fight with a perfect record of 12-0-0 (9 KOs=75%) and he is ranked as the No.13 super bantamweight in the world. Between 2016 and 2017 he has beat Benjie Suganob, Jin Wook Lim and Nehomar Cermeno (=Cermeno vs Kubo). His opponent, Daniel Roman, has a boxing record of 22-2-1 (8 knockouts) and he entered as the No.21 in the same weight class. He suffered his last loss when he faced Juan Reyes in 2013, since then he has won 14 consecutive fights beating Adam Lopez in his last one (=Roman vs Lopez). 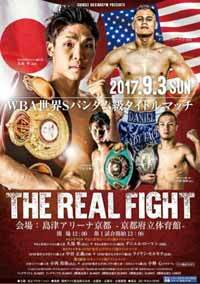 Daniel Roman vs Shun Kubo is valid for the WBA World Super Bantamweight title (Kubo’s first defense). Watch the video and rate this fight!